Now, to wrap up my DC journey. Yesterday was it – our last chance to explore this city and ensure that we left with no major regrets. The first stop yesterday was the Holocaust Museum. This was something I had wanted to do the entire time in DC but I had never heard significant interest from other people and really didn’t want to go alone. But it turns out that there were a few other people in the house who had really wanted to do it as well, so we seized the moment and went. There’s not really a lot to say about the museum itself. Which isn’t meant to imply at all that it’s not worth seeing or not a good museum – far from it. But, it is exactly what you think it is: moving, heartbreaking, horrifying, fascinating and even at times hopeful. In terms of its quality simply as a museum, I think it was very well done. It unfolded very logically and you leave with a strong idea of how discrimination and scapegoating of Jews and other marginalized peoples warped into mass murder. One thing I liked about its setup is that as you move between floors, you would always cross on walkways with glass walls that let the natural light pour in. I’m guessing it was a deliberate design. These walkways give you a chance to take a deep breath, collect yourself and prepare to descend once more in the darkness of the exhibits—a darkness that is both literal and figurative. The Jefferson Memorial, on the side not obscured by construction. After the museum, we headed to see the Jefferson and FDR memorials. 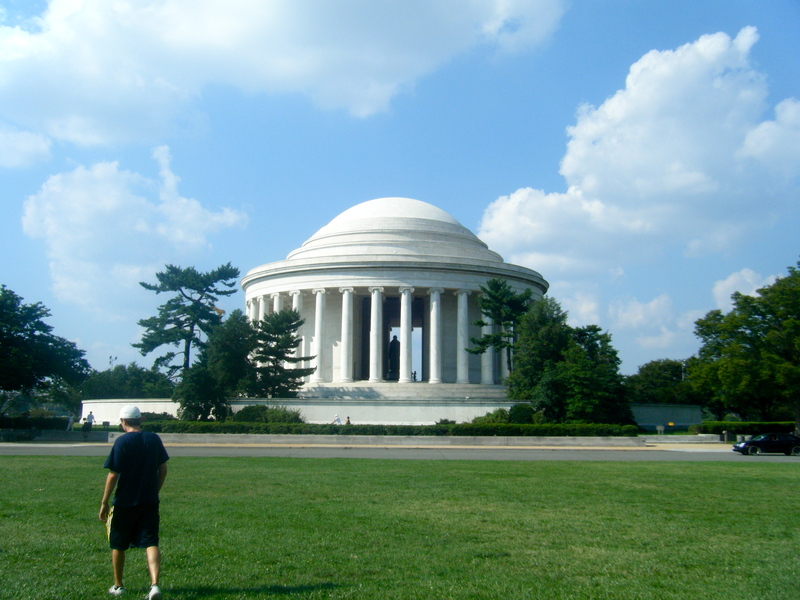 I had heard a lot of great things about the Jefferson Memorial; a lot of people have told me it’s their favorite of the monuments and memorials. It’s located on the Tidal Basin south of the Mall and the walk there is quite pretty, curving along the water and lined with trees. I have to say though, I was not quite as enamored with the memorial as it seems everyone else is. A lot of it has more to do with the setting than the structure itself. They are currently doing construction on the pavilion in front of the memorial so there were both a lot of loud noises as well as ugly machinery marring the view of the structure in front of the water. Additionally, it’s quite close to the Reagan airport, so there’s a lot of ambient noise from airplanes coming and going. Adding the throngs of tourists into the mix, the memorial becomes anything but a peaceful place. I’m sure it would be lovely at night, and of course would be much better when the construction is over, but for now I’m not so sure what the hype is about. Which is weird to type, since it means I know have enough of a basis of knowledge about to DC to have strong opinions about memorials. After the Jefferson, we walked around the basin to reach the FDR memorial. I had also heard a lot about this one as an often-overlooked but very pretty memorial. This one definitely lived up to expectations. It’s very different from the other memorials because it’s not just a single structure. It’s a series of water features, statues, stone walls inscribed with quotes and other elements stretching along a long path. You don’t just visit the FDR memorial—you explore it. 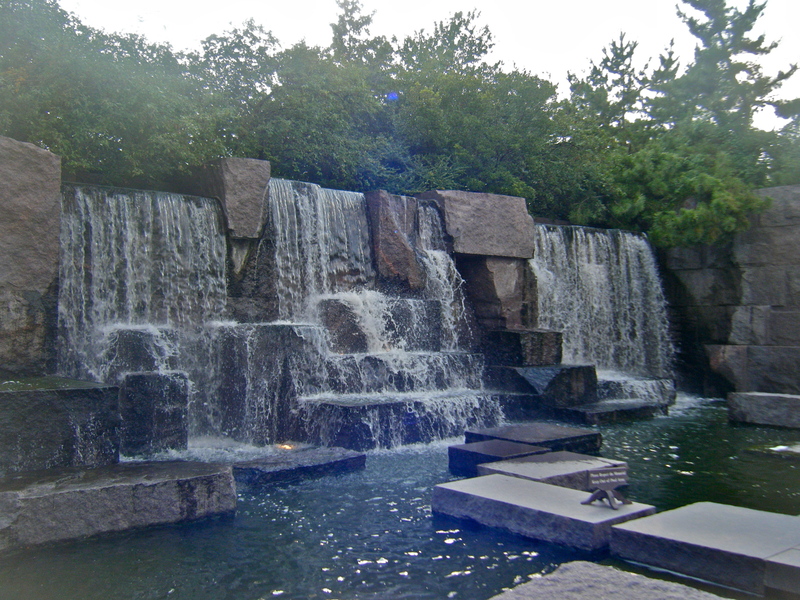 If you like water features, you'll love the FDR memorial. It’s broken into four parts for each of his terms, and the quotes and features of each section are particular to the events of thatterm. So, the section pertaining to the Great Depression and the New Deal has statues of worn and weathered men standing in line waiting for aid, and the section pertaining to World War II has quotes specific to his thoughts on war. It’s all very lush and peaceful (much less heavily trafficked than any other memorial or monument, probably because it requires more walking to get to). Favorite Monument/Memorial: I have to say the Lincoln Memorial. I know this isn’t a very novel choice, but it just seems to have the best of everything. It’s a beautiful structure with massive historical significance (so many important speeches and events have happened there). It also has a terrific view of the mall, and, as I experienced myself, is a lovely place from which to watch the sunrise. Least Favorite Monument/Memorial: The Washington Monument is cool to look at from the ground, but I don’t think going to the top was really worth it. Granted, you don’t have to pay for tickets, you just have to reserve online or stand in line really early in the morning. But it doesn’t really offer anything special. You go up to the top, you look through little dirty windows at the city, you go back down. I suppose if you like heights it’d be cool, but I’m kind of indifferent to that. Favorite Smithsonian: American History by far. I’m not a history buff per se, but this museum just had so many fascinating exhibits and neat holdings, like the actual Star-Spangled Banner or Dorothy’s ruby slippers. It’s a museum of American culture as much as it’s a museum of American history. Least Favorite Smithsonian: I didn’t enjoy the Air and Space Museum much, but that has more to do with my personal tastes. I don’t really like science and engineering when they get technical, nor do I have much of an appreciation for technology and “how things work.” So all the exhibits on planes and flight were much too dry for me. The space side was better, though. Favorite Thing That Wasn’t Free: The Newseum. You know why. Favorite Restaurant: I’m sure DC is a foodie’s heaven…if you have the money. I didn’t, so we didn’t do a lot of eating out. But, there was one place we kept going back to, and that place is Good Stuff Eatery. It’s a burger joint, but more like 5 Guys than McDonalds. The burgers are handcrafted and juicy, the fries are creatively seasoned, and the milkshakes… ah, the milkshakes. It’s possible that more than anything, I’ll miss late night runs to Good Stuff. If you are ever in DC, go there. It’s worth every penny.